The BSc. Applied Accounting Degree of the Institute of Chartered Accountants of Sri Lanka (CA Sri Lanka) recorded the highest ever intake this month at it’s 12th intake with over 255 students registering for the academic programme. Speaking at the inauguration ceremony of the 12th intake, President of CA Sri Lanka Jagath Perera said that the degree programme is continuously been improved and it witnessing a remarkable popularity among the public. “To date all the students who have completed the degree programme are enjoying a higher level of employability, which is testament that the degree programme guarantees employability at 100%,” he said. Perera said that the main yardstick to measure an institute is the employability it provides to the students following the completion of a professional or academic programme. “In this regard, CA Sri Lanka scores very highly,” he said. According to Perera, any student at any level exiting CA Sri Lanka are guaranteed to be employed, whether they be graduates of the BSc. Applied Accounting degree, or were part of the Chartered Accounting programme. Speaking at the event, Vice President of CA Sri Lanka Manil Jayesinghe said that accounting plays a critical role in everyone’s life. “People tell me without engineers the world won’t survive, and it will not witness any innovations or new products, but when an engineer comes up with a new product, it is finance professionals who help the engineer secure the necessary funds to develop the product,” he said. He also noted that for 60 years CA Sri Lanka has been producing accounting professionals to the market, and a significant percent of these professionals hold the highest position in companies. “I hope when all of you complete your degree programme, you will also reach this level of success,” Mr. Jayesinghe added. 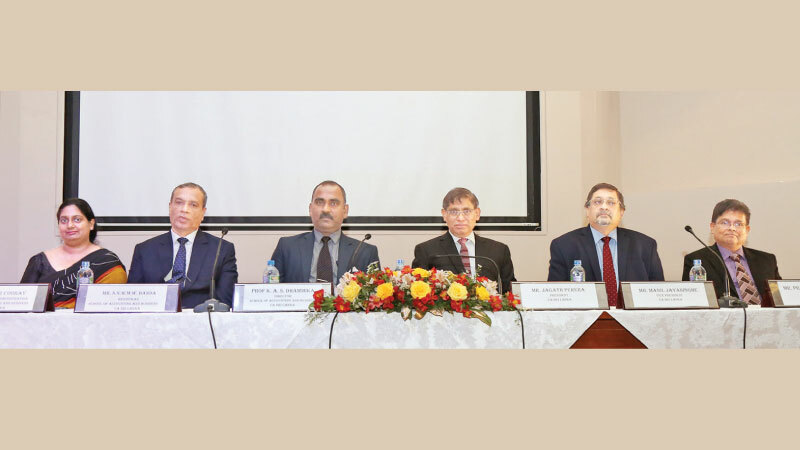 The total student population at the CA Sri Lanka School of Accounting & Business which is conducting the degree programme approved by the University Grants Commission currently stands at 1129 students. Over 300 students have graduated since the Institute launched the degree in 2013. During the inauguration a guest lecture was delivered to the new students by Dr. Chandana Gunawardana, Training Consultant in Human Potential Development and physiology.